Food & Wine for the Weekend! 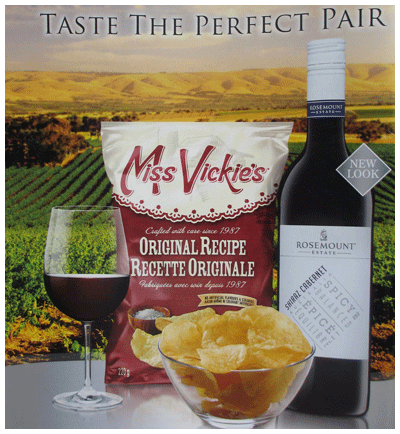 Australia’s Rosemount Estates has partnered with Miss Vickie’s Potato Chips for a refreshingly simple take on wine & food pairing. Four Rosemount wines are paired with four potato chip flavourings. As I was checking out the combinations I realized that the important message is to not to sweat the thing – have fun drinking, munching and doing your regular stuff. Overall I found that the chips cut the slight sweetness in Rosemount wines – a positive thing for me. California does Tuscany – On Sale!